Celebrate the 2019 Law Day theme with Mary Beth Tinker and MCCE. 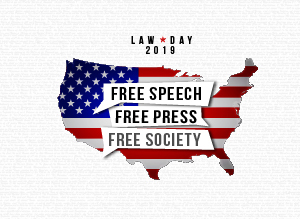 Every year, the American Bar Association (ABA) announces a Law Day Theme. ABA’s 2019 announced theme is Free Press, Free Speech, and Free Society. We are celebrating this year with an essay contest, speaking events with Mary Beth Tinker and a MCCE trivia night fundraiser hosted by Mary Beth herself. Join Mary Beth Tinker as she tours Michigan to visit students and champions of Free Speech and Free Press Law Day week. As the court case Tinker v Des Moines Independent School District (1969) turns 50, join us in analyzing the First Amendment today. Mary Beth will share the stage with students who champion this theme and who represent Free Speech and Free Press. Download the all event flyer here. May 1 – Grand Rapids at the Gerald R. Ford Presidential Museum. Register HERE by April 22. Coming to a Law Day Event? Consider these resources to prepare for your visit! “In December 1965, Mary Beth Tinker was part of a small group of students who made history by wearing simple black armbands to school. Her brother, John, and their friend Chris Eckhardt were among the others. At the time, history was the last thing on their minds. Mary Beth was a shy 13-year-old, John had just turned 15, and Chris was 16. View elementary, middle, and high school lessons from the American Bar Association here. Learn more about Law Day from the American Bar Association. Additional resources from the Michigan State Bar Civic Education Resources. Diversity and Inclusion Resources for the Legal Profession from the Michigan State Bar. Consider the ABA’s Leon Jaworski Program Questions. Are twenty-first century communication technologies so changing how we produce and consume information in the public sphere that they threaten to undermine the freedoms of speech and of the press that sustain deliberative democracy? What is the “marketplace of ideas”? What is its significance for the First Amendment? Does the “marketplace of ideas” still offer a powerful rationale for freedom of expression or is it outmoded in a networked era of ubiquitous and rapidly disseminated information, fake news, and weaponized political speech? If the latter, what might replace it? Does protecting a free society from disinformation present such a compelling interest today that we should reformulate the role that law can, and cannot, play? What might be done and by whom? Courts? Legislatures? Law enforcement? Regulators? Others? How can we best maintain our commitments to free speech and freedom of the press while confronting our information-society challenges? *The comments and views of our guest speakers are entirely their own.